This is just a glimpse into life in Berlin. Having only spent five days there in July, I’m definitely not an expert but this won’t hold me back from sharing my little experiences with you. 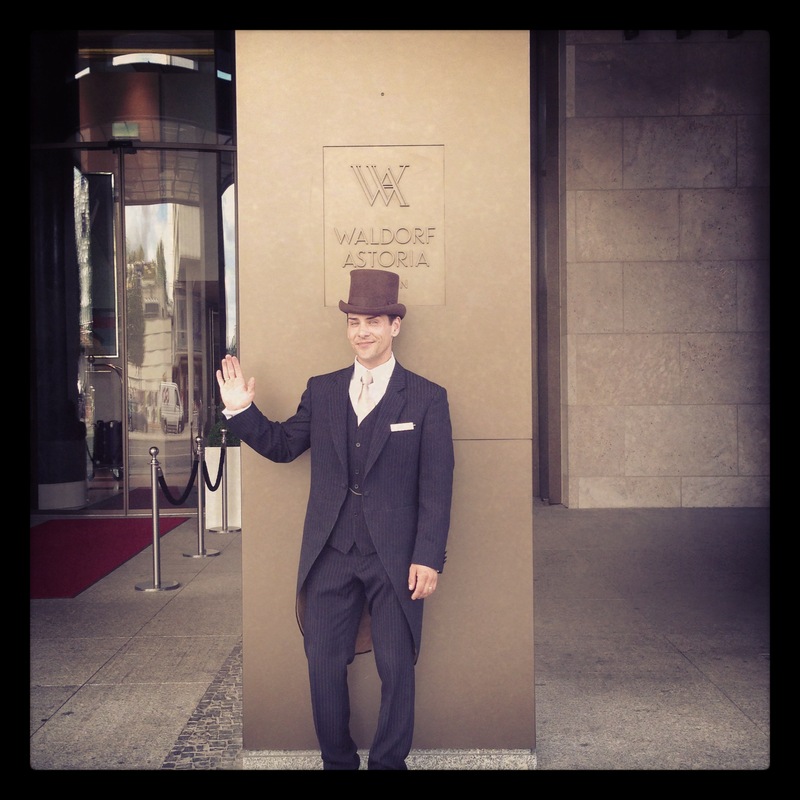 Highly recommended: The Waldorf Astoria in Berlin. It might sound too expensive to even check it out, but you should give it a try. I believe it is not as expensive as its famous counterpart in NY. Especially if you plan a weekend trip or a trip when it is not high season for trade fairs or other congresses. Being a typical business hotel, the Waldorf Astoria is rather quiet during weekends and off business season. So, give it a try, check out their website and you might be positively surprised by the price on offer. It was opened in February this year and everything is still very new and clean. Their beds are the best I’ve ever slept in. The pillows, the duvet.. a sleep-fanatic’s dream! Same goes for the breakfast buffet.. everything you can wish for.. from Continental to English, from Nutella to gluten-free bread, from fruits to pastries, from champagne to lemon juice. Besides the interior, it’s also the location that’s convincing. Right, across from “Bahnhof Zoo”, it’s central and gets you anywhere you want to go in Berlin. Although, Bahnhof Zoo has had an extremely bad reputation when I grew up, the area is about to get a facelift and apparently all the drug dealer and prostitutes have been removed from the train station and the zoo. It is also walking distance from the Kurfürsten Damm (Berlin’s high-end shopping mile) and the biggest department store on the continent, the KaDeWe. If I ever go back to Berlin, I guess I would want to stay there again, except, if the Adlon offers the same price… then I might change my mind. Staying in the Adlon once in your life, is a must (just like staying at the renowned Waldorf Astoria). A must for anyone visiting Berlin is to have “Currywurst“, the traditional Berliner dish. Usually you eat it as fast food at a kiosk. There are currywurst places that claim for themselves to have the best currywurst in town. One of these kiosks’ was right across from our hote: “Curry 36”. It was OK’ish. I guess I expected more of it. The other one is “Curry One” which I must say, I definitely preferred. We went to the one right next to the East Side Gallery. 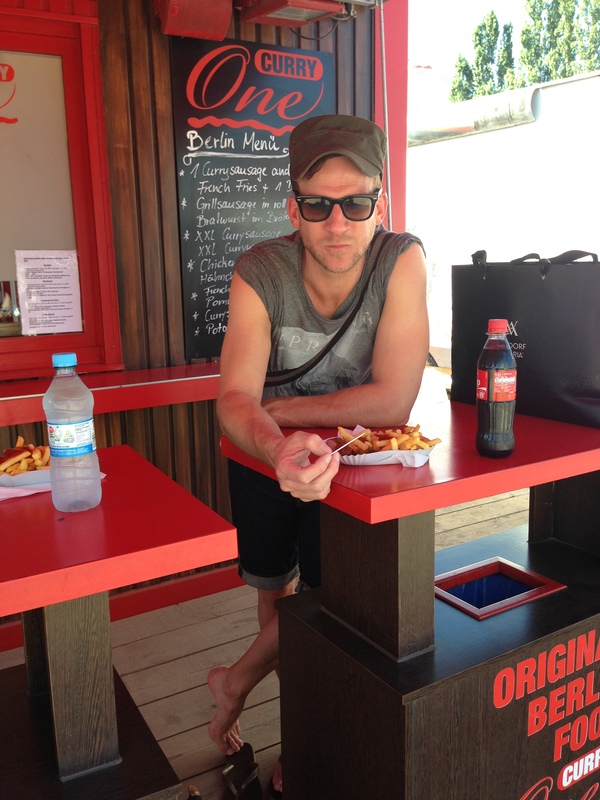 The traditional way is to eat your fast food currywurst while standing. Although this place also offered something like a beach-bar area where you could sit and eat.. we did it the traditional way! A proper restaurant (not as in kiosk fast food) that was recommended to us was “White Trash“. We decided to go on a Sunday night (in fact, that was the only night that was still open), which was probably the most quiet night of the week. Still, a very interesting place to go. Probably not your type of restaurant for a romantic dinner, but if you are out and about with a few friends and up for some fun, then that’s definitely the place to go. Located on Schönhauser Allee, it is the right location to move on from there after dinner and check out the bars Berlin has to offer. Then, there is Asian cuisine trending in Berlin. So, the one evening friends took us out to ChénChè Restaurant/ Teehaus Berlin-Mitte. It has this cute little “beer garden” in the back where we had Vietnamese dishes and tiger beer. A really nice atmosphere, with delicious food and great company accounted for this special evening during our trip. If you want to go clubbing.. hard clubbing, go to the Berghain. I can’t tell you more about it, because I didn’t go. The guys did and they loved it! Apparently they had the best night. Acting as three gay guys, well, actually only two acting. From what I’ve heard if you’re gay it’s your ticket to get in. If you prefer it a bit more chilled, then there are plenty of beach clubs (especially in summer). We were lucky, we had 5 stunning summer days when we were there. On Saturday we spent a few hours at the Badeschiff with some Corona beers and just chilling in the sun. I wish our schedule would have allowed us to spend a whole day there.. but there is just too much to do and see in Berlin. The Badeschiff is basically a floating pool in the River Spree, which a beach bar, sand and deck chairs (if you’re lucky). Shopping in Berlin is fun (finally, again). All around Mitte, close to the Hackesche Höfe and all around that area, you can find plenty of boutiques and shops that really invite you to shop. This is how shopping should be. Individual shops with individual brands and local designers. Unlike here in Jozi for example where you shop in malls and malls and malls (with the odd exception of maybe 4th Avenue in Parkhust). I guess, we could’ve done much more shopping if we had the time. As far as I remember we said we’ll go shopping for a maximum of 3 hours and then do a bike tour through Berlin. Needless to say that the bike tour never happened. This is my little insight into Berlin. Of course there is also the usual sight-seeing stuff, like Brandenburger Gate, The Reichstag (book your visit of the glass dome beforehand online), the TV tower at the Alexander Square, East Side Gallery (the Wall), Checkpoint Charlie, the Holocaust Memorial and so on. We did this, too. We also did Base Flying from the Park Inn Hotel (well, I didn’t but the guys did). We did loads of things during these 5 days. So my advise: Take more time! Enjoy Berlin if you go!